The example of Slovenia, which has successfully reformed the public health system in the last few years, and has many good practices to follow in improving the population’s health status and equity, can serve an inspiring model for the Republic of Moldova. This experience will contribute to better planning and ongoing change of the institutional structure of the public health service in the Republic of Moldova. The visit also provided the opportunity to build bilateral institutional relations, in the context of the country’s aspirations to join the European Union. To familiarize themselves with the Slovenian experience, the delegation held working meetings with the management team and representatives of the Public Health Institute; the National Laboratory of Health, Environment and Food; the Health Inspectorate; and the Administration for Food Safety, Veterinary Sector and Plant Protection. Public health professionals and health inspectors from the Republic of Moldova also learned in detail about the organizational structure and specific responsibilities of the Health Inspectorate, as well as how they are reflected in the processes and structure that enable a rational system for planning of work and activities. Dr Aliona Serbulenco, State Secretary for Public Health, Republic of Moldova, commented: “Slovenia’s experience has shown us that the reorganization of the public health service enabled the country to define public health priorities according to the needs of the population in the regions, to increase the availability of prevention programmes and to implement them more effectively. The existence of a single institution responsible for public health, and the clear distribution of roles in Slovenia is a blueprint for similar developments in the Republic of Moldova”. 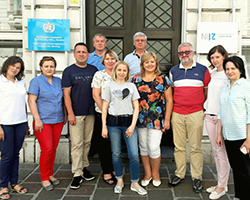 The study visit was organized within the framework of the biennial collaborative agreement for 2018–2019 signed between the WHO Regional Office for Europe and the Ministry of Health, Labour and Social Protection of the Republic of Moldova, and as part of the Support to Strengthening Governance and Policy Dialogue in Health Sector – 2nd Phase, funded jointly by WHO and the Swiss Agency for Development, and Cooperation and Contribution for Activities towards Universal Health Coverage, funded by the Government of Japan.